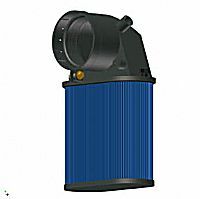 9/1/2005 - Walker's new Everquiet Air Filter unit is specially designed for M11 engines rated at 660HP or less. Add high performance air filtration and a reduction in turbo noise when you equip your M11 Cummins marine engine with this new Everquiet air filter unit. The robust housing is metal and designed for years of trouble free service in the tough marine environment. The air filter element is removable so cleaning or replacement is easy and fast. First issued as a factory upgrade option for the higher horsepower Marine M11 engines, a retrofit unit is now available for engines currently in service rated at 635Hp and 660 HP. 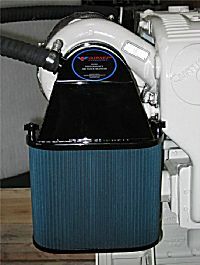 The unit replaces the plastic disposable stock element often delivered with the engine. This unit represents the latest in engineered air flow systems, and will deliver years of optimized performance from your engine whether used for commercial fishing, high speed pleasurecraft, or military applications. You may order the unit direct from Walker, or through your local Cummins Marine or AIRSEP dealer. Part Number is 90-1302. These units are increasingly in high demand, so order today to avoid a long wait.